Nancy Emberton, of La Quinta, California, poses after sinking a hole-in-one. July 27. at The Mountain Course in Incline Village. INCLINE VILLAGE, Nev. — George Croom sank the first of two aces in three days on a sunny Tuesday, July 24, at Incline Village’s Mountain Course. The 83-year old from Montreux, Nevada used a 9-iron from about 92 yards on the par-3 12th hole for his third career ace. Croom has played golf for 30 years and his first two aces were recorded at Vintage Country Club in Indian Wells, California. Nancy Emberton, of La Quinta, California, sank the second hole-in-one on July 27 at the Mountain Course. 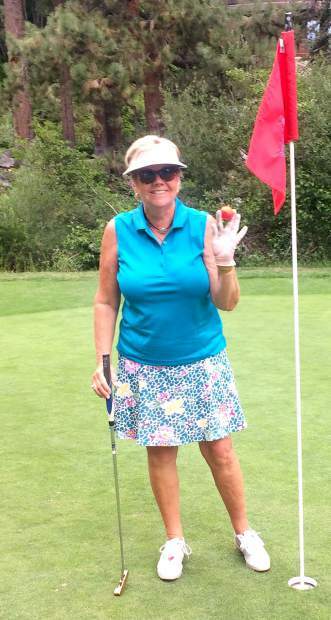 The 69-year old used an 8-iron from about 117 yards on the par-3 15th hole to record her first ace. She was playing with partners Doug Emberton, Nini Hillebrand and Jeff Hillebrand. Emberton has been playing golf for 15 years and normally plays at PGA West, a venue that has hosted PGA and Senior PGA Tour events.